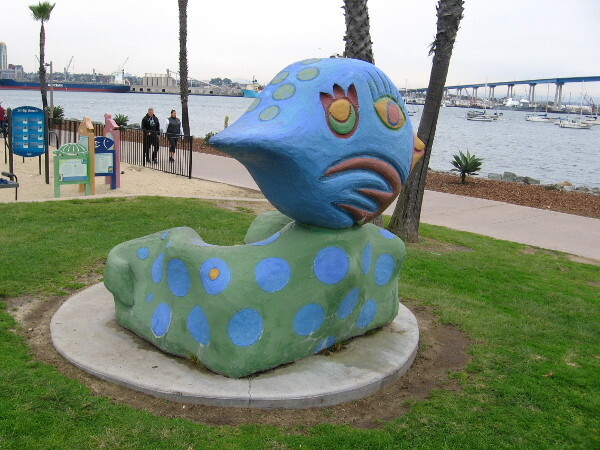 sculptures – Cool San Diego Sights! A fun walk along Shelter Island Drive. 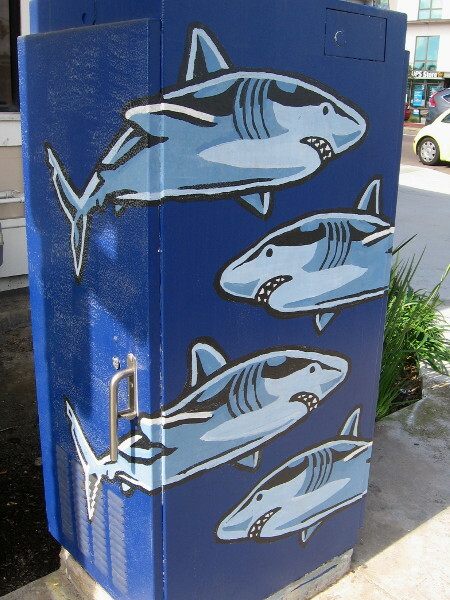 Shark street art on a utility box at the corner of Shelter Island Drive and Rosecrans Street. This morning I headed to Point Loma to visit three sites participating in the San Diego Architectural Foundation’s 2019 OPEN HOUSE SAN DIEGO. 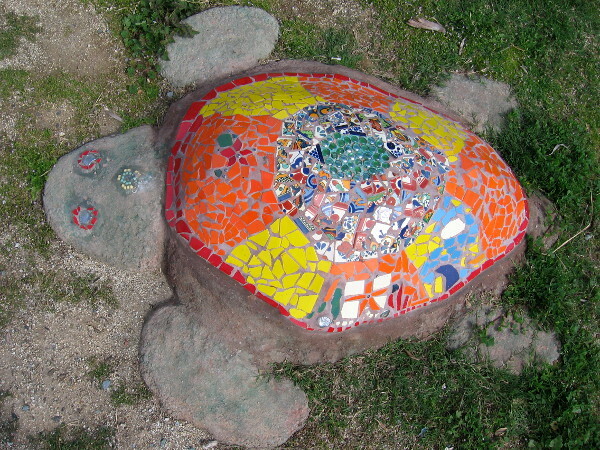 All three are located in a neighborhood at the foot of Shelter Island–an area once populated by many Portuguese fishermen. 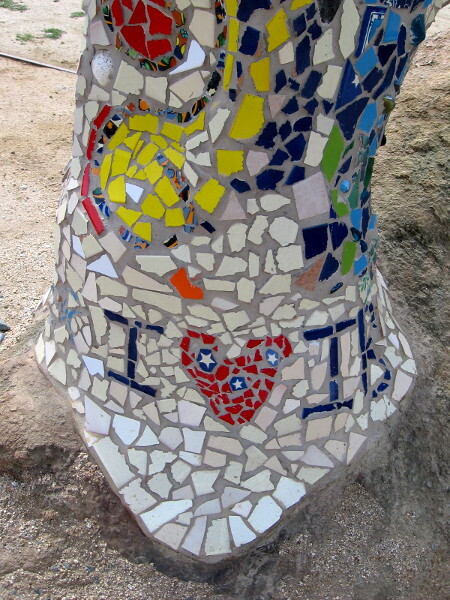 I think you might enjoy a look at Little Portugal’s history and some of its landmarks. 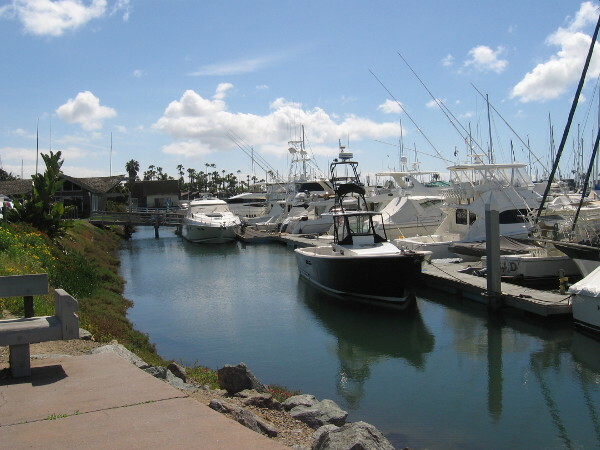 Before I sort through all those photographs, however, please enjoy others photos I took during a fun walk down Shelter Island Drive, from Rosecrans Streets to the recently improved Shelter Island boat ramp. 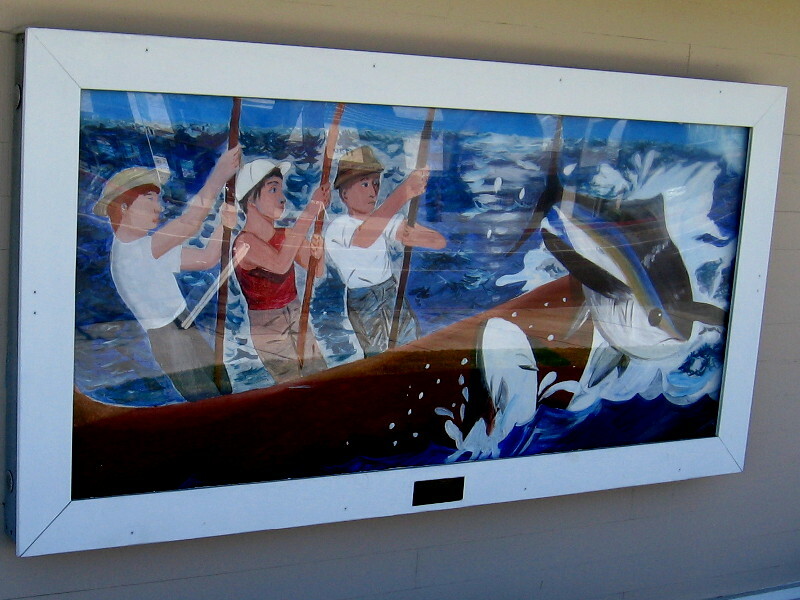 The Union Bank on the corner of Shelter Island Drive and Rosecrans Street has a colorful mural near its entrance. Tuna fishermen with poles out on the Pacific Ocean. 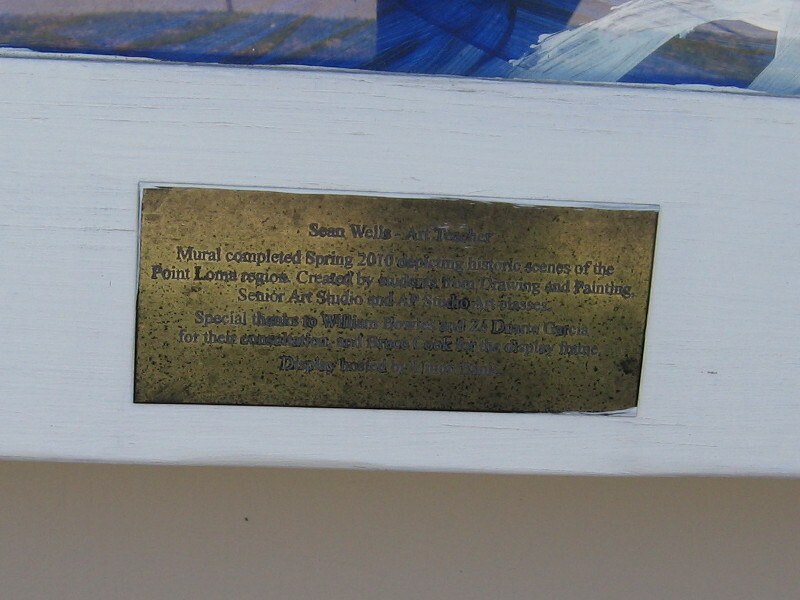 Plaque describes the above artwork. 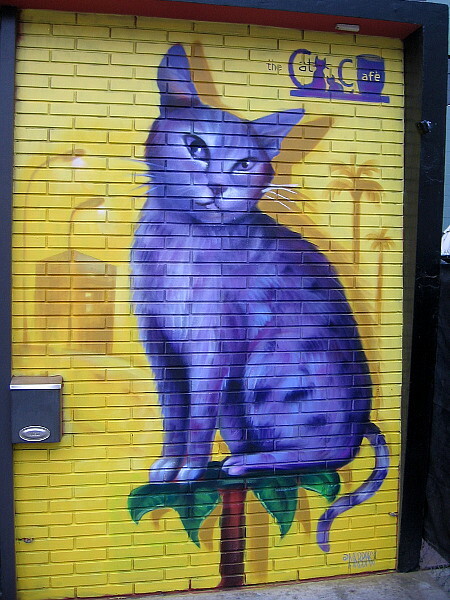 Sean Wells – Art Teacher. 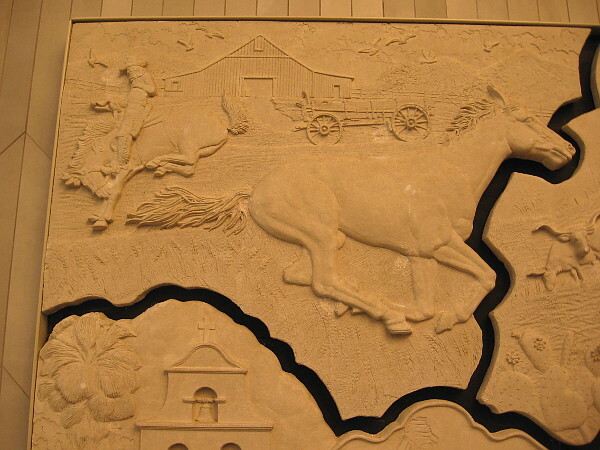 Mural completed Spring 2010 depicting historic scenes of the Point Loma region. 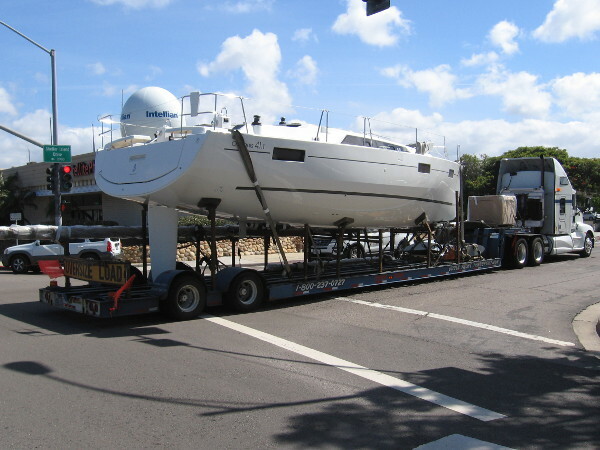 As I began walking along Shelter Island Drive, a gigantic yacht passed down the street! A few benches overlook a corner of the Shelter Island Yacht Basin. It’s a nice place to sit in the sun and relax. 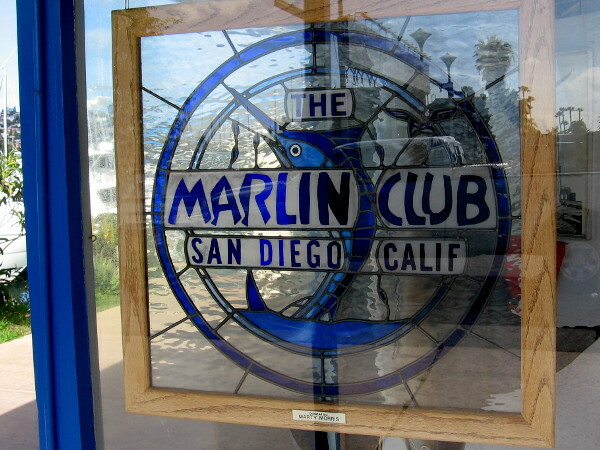 I spotted this cool stained glass panel in a window of The Marlin Club. I remember seeing several huge fish suspended here years ago, before I began taking photos for this blog. 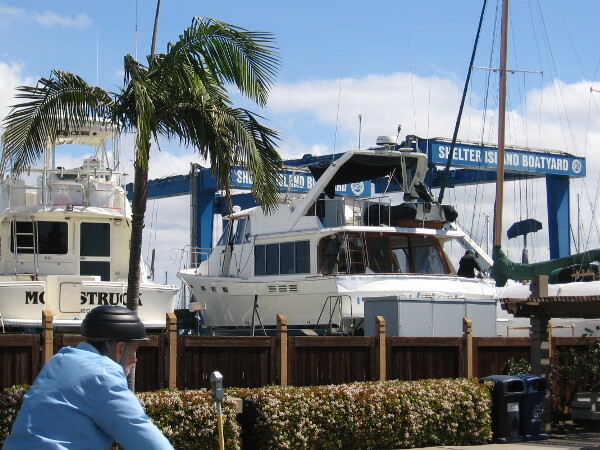 Someone bikes past a huge boat lift at the Shelter Island Boatyard. 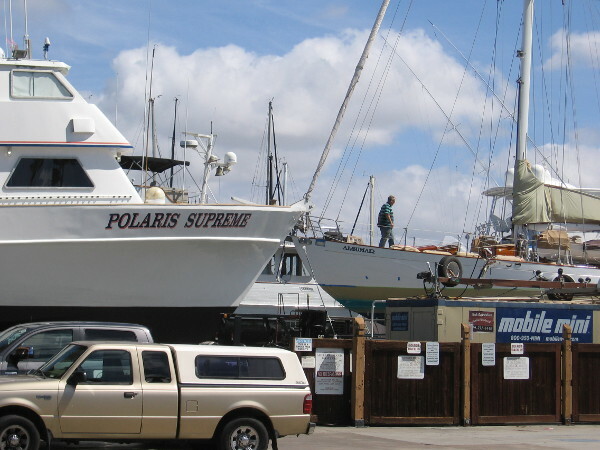 Those yachts being repaired seem to be up in the sky! 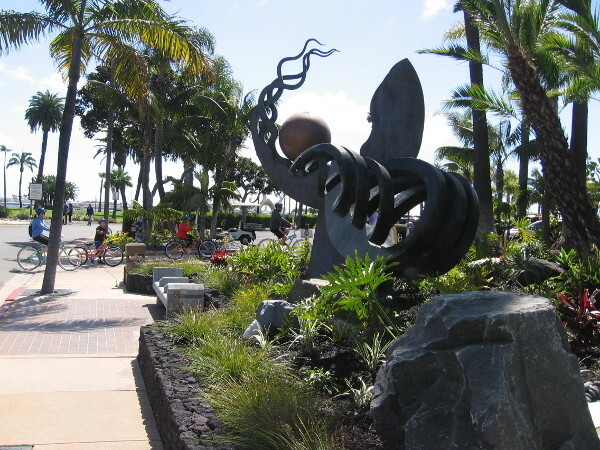 People bicycle near the Ocean Song sculpture in front of Humphreys Half Moon Inn. 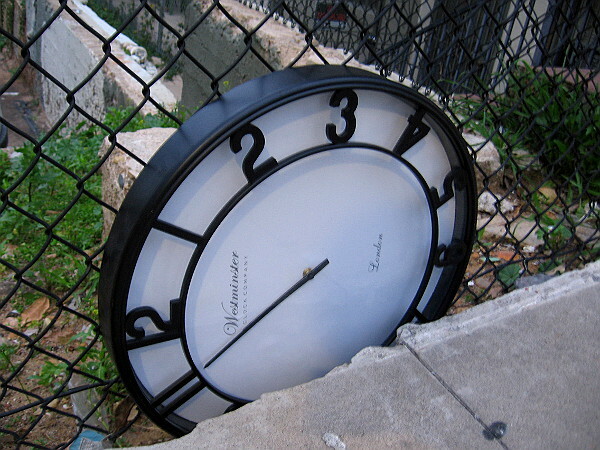 This cool public art was created by Alber De Matteis. 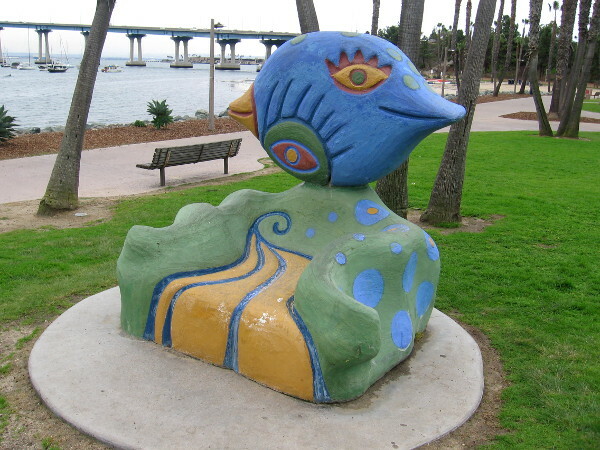 As I approach San Diego Bay, I see the Pacific Portal sculpture by local artist James T. Hubbell. 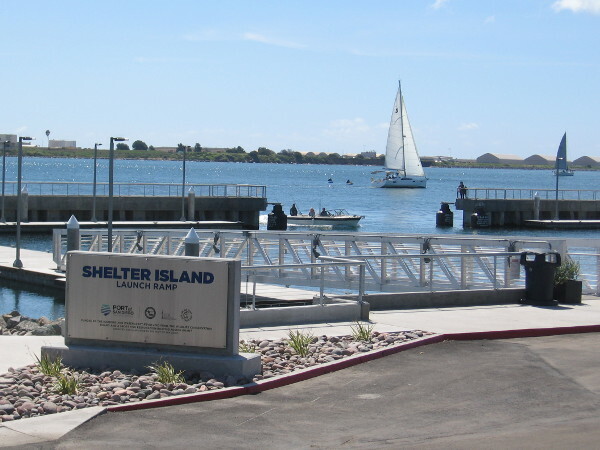 I’ve arrived at the recently improved and enlarged Shelter Island Launch Ramp. 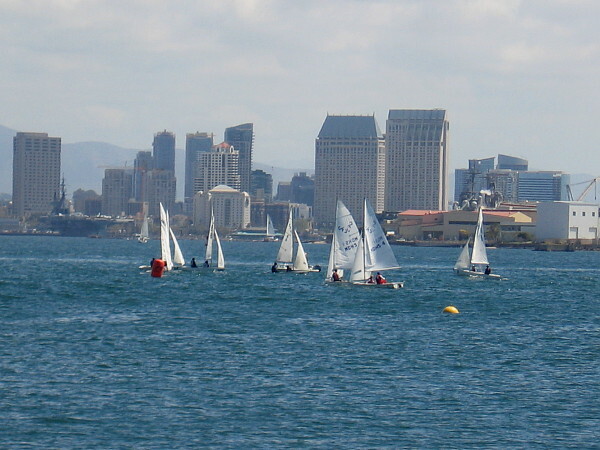 Many recreational watercraft enter San Diego Bay here. 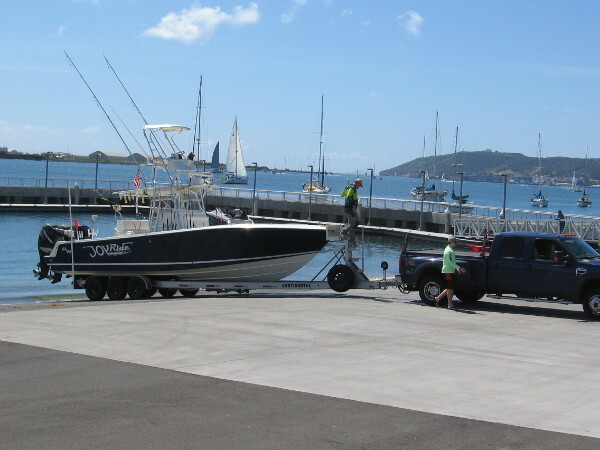 Looks like these guys backing their boat into the water intend to spend the day fishing. 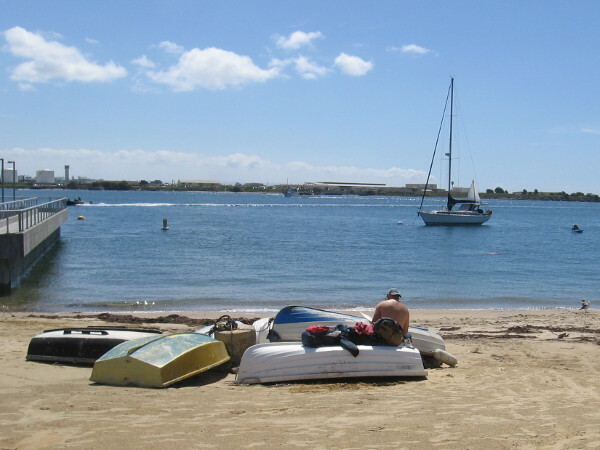 Someone hangs out nearby, sitting among beached dinghies. 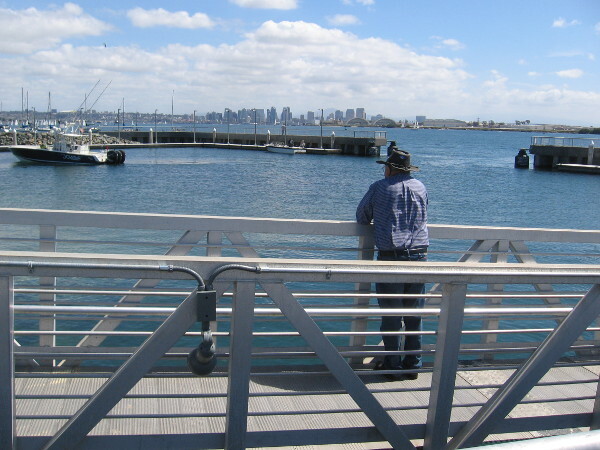 Looking across the boat launch basin, the San Diego downtown skyline in the distance. I see some sailboats racing in the distance, between here and Harbor Island. 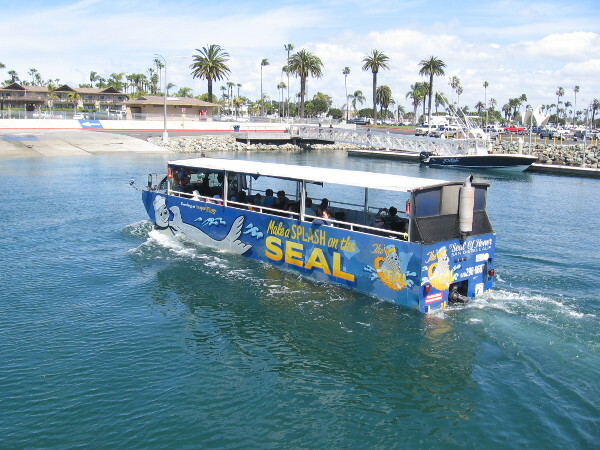 Here comes an amphibious SEAL tour boat. 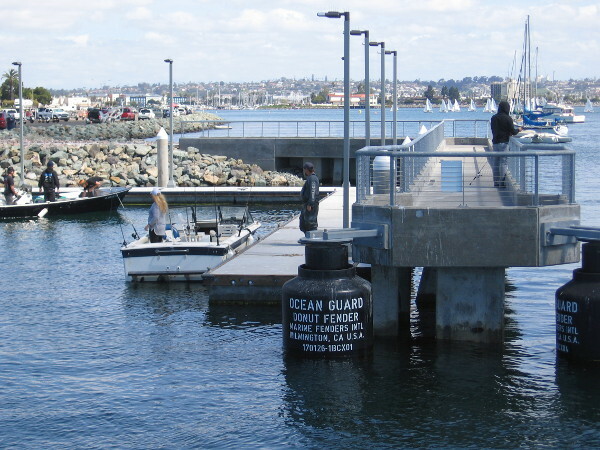 Tourists float out toward the entrance of San Diego Bay, then turn around near the submarines at Naval Base Point Loma. 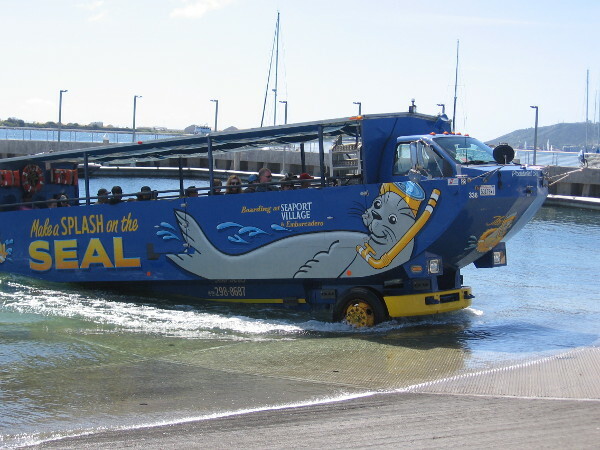 These cool vessels drive right out of the water and up onto the boat ramp! 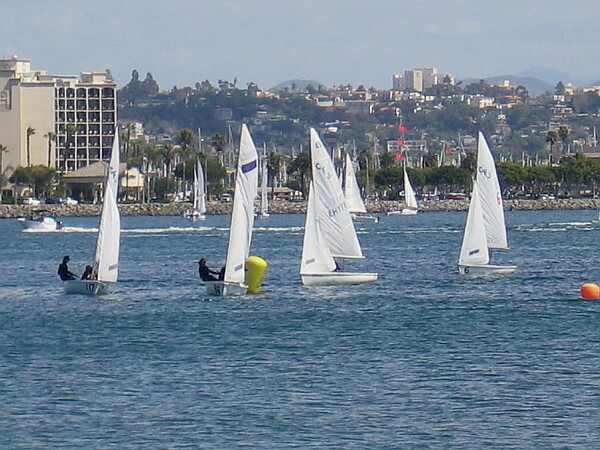 After walking a bit, I’m nearer those small sailboats that were racing in the distance. 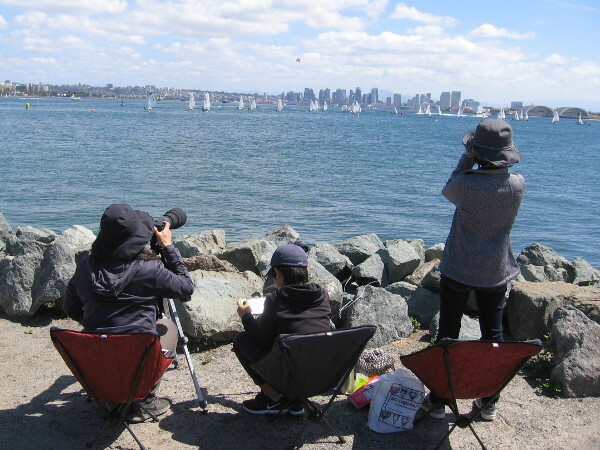 Some people by the rocky shore watch even more distant sailboats with binoculars. My small camera zooms and just manages to capture a nice image. Look! 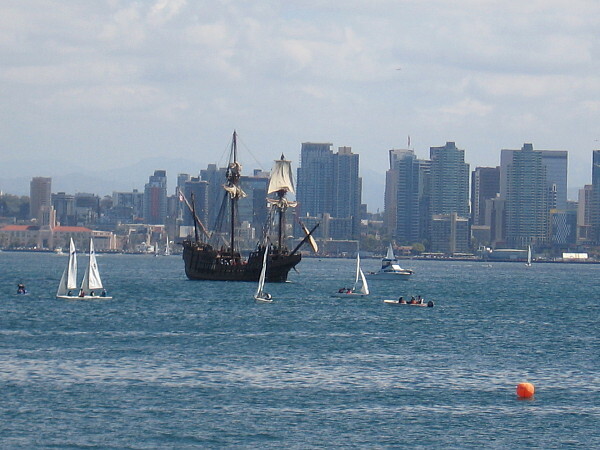 Here comes San Salvador, the Maritime Museum of San Diego’s amazing Spanish galleon replica! Now that is one very cool sight! 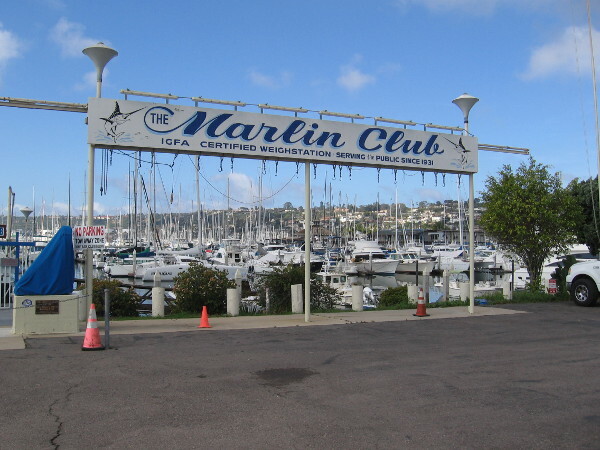 Posted on March 23, 2019 March 23, 2019 Tags boats, fishing, marinas, photography, point loma, sailboats, san diego, san diego bay, sculptures, shelter island, skyline, street art, walking, waterLeave a comment on A fun walk along Shelter Island Drive. 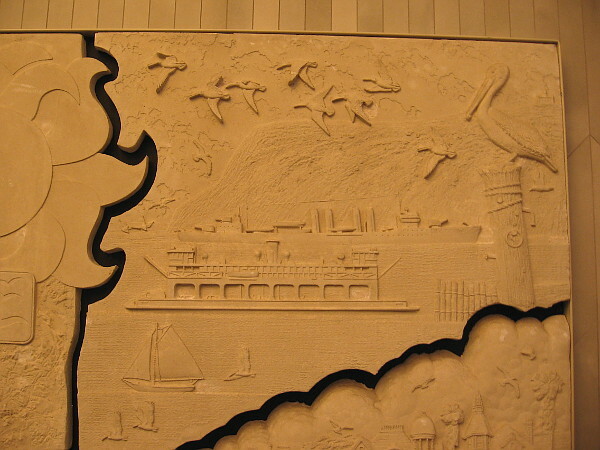 Sand sculpture murals show San Diego history! 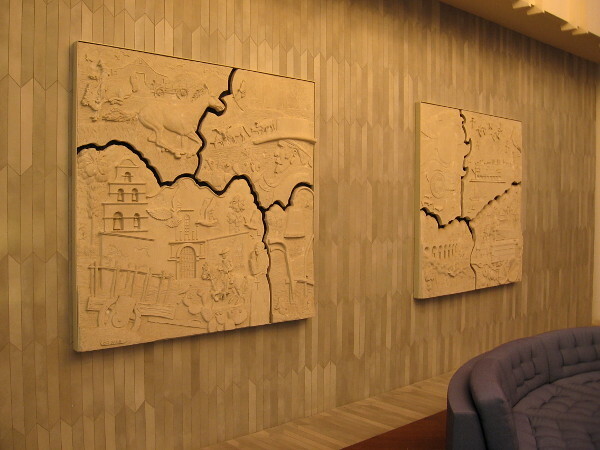 Two bas-relief sand sculpture panels by renowned artist Charles R. Faust in the lobby of 2550 Fifth Avenue in San Diego. 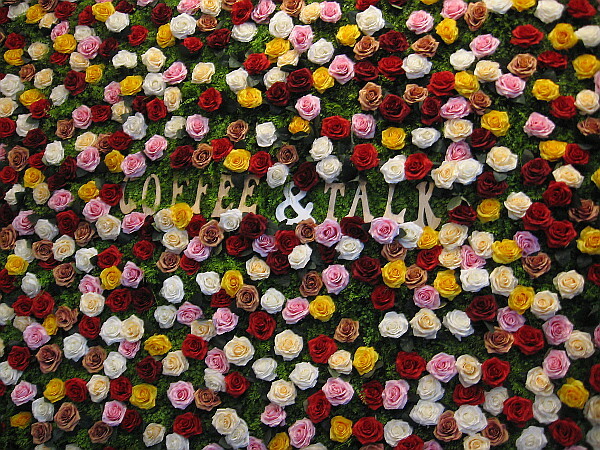 Two amazing works of art can be viewed inside an office building in Bankers Hill. 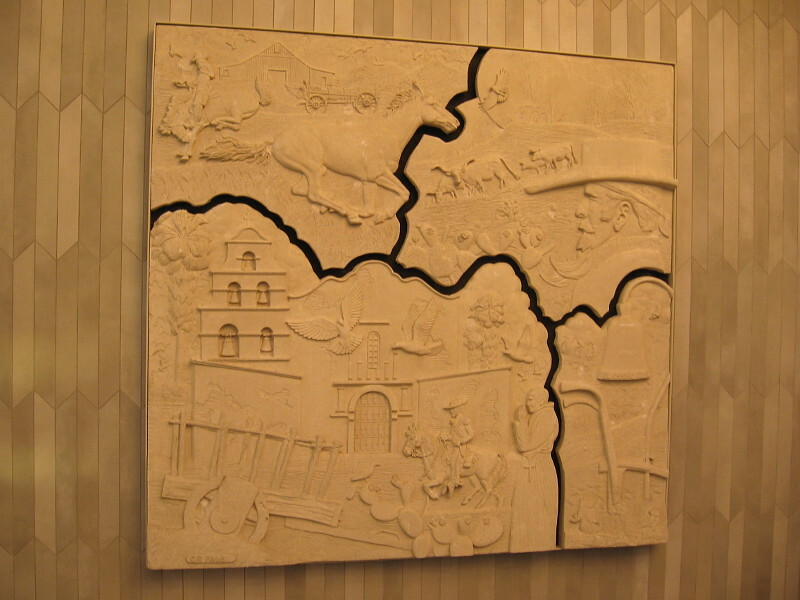 The small murals–sculptures made of sand that appear as bas-relief panels–decorate a wall in the lobby of 5th & Laurel, the building best known as the home of Mister A’s restaurant. 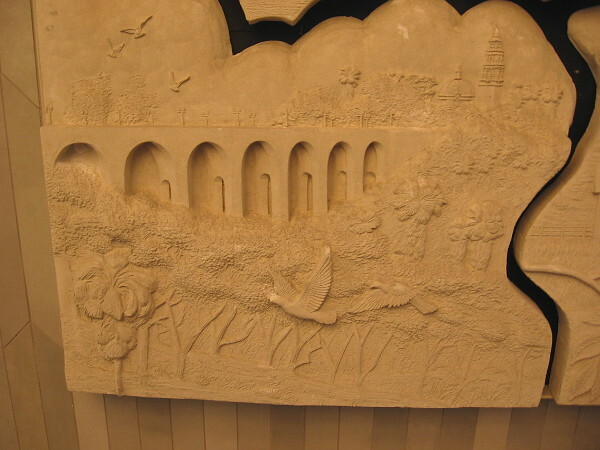 Commissioned by the now defunct Great American First Savings Bank to celebrate their Centennial in 1985, the two panels depict important San Diego landmarks and aspects of local history. 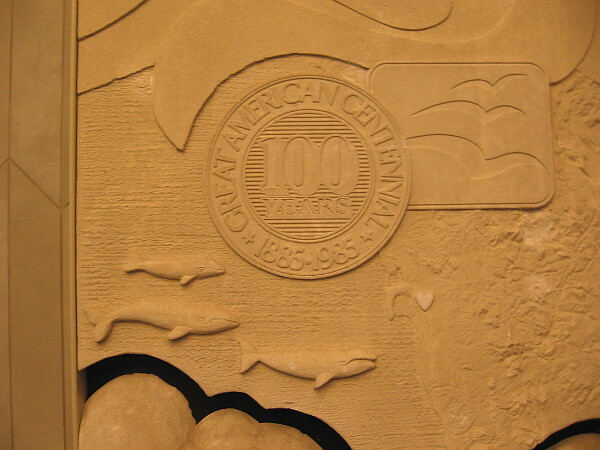 The two sand cast panels were created by Charles R. Faust (1922 – 2000), a prolific artist who for many years worked as the director of architectural design at the San Diego Zoo. His invention of moated animal enclosures in the mid-1950’s revolutionized how the world famous zoo and their Wild Animal Park near Escondido exhibited animals. He also designed the San Diego Zoo’s huge walk-in aviary–the first of its kind in the world. 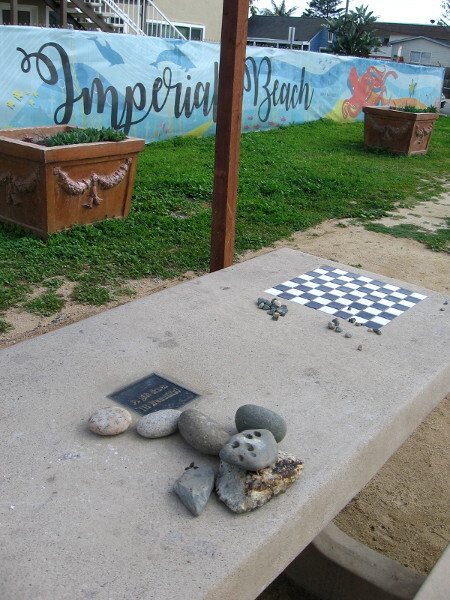 After retiring from that job, Charles opened Faust Sand Casting in Ocean Beach with his son. Over his creative lifetime the art of Charles Faust would also include fine drawings, watercolors and oil paintings, many of which depicted life in the Old West, a theme he loved. 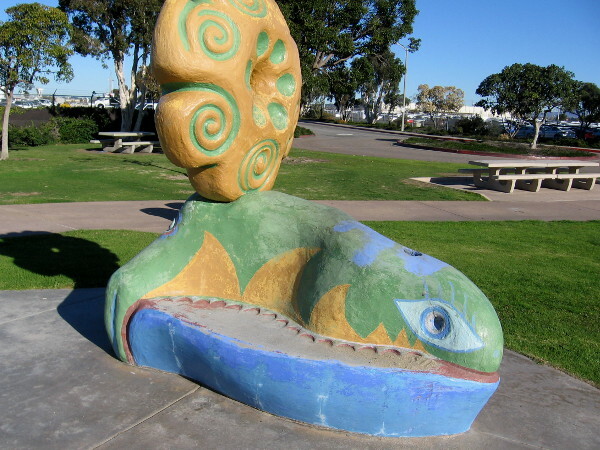 His sand sculpture murals have added beauty to many locations around San Diego. 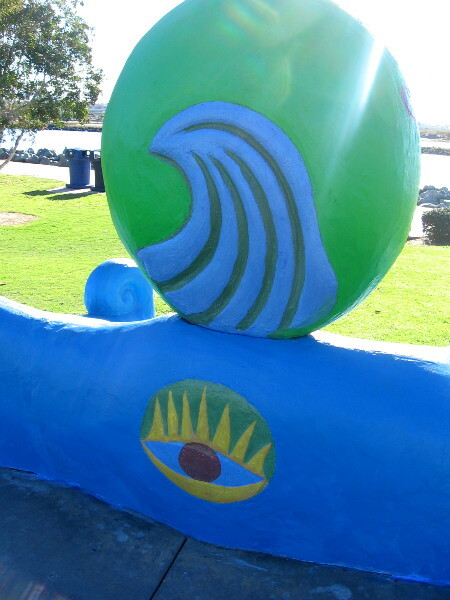 I photographed a couple of these murals in the past for Cool San Diego Sights, without realizing at the time they were created by Charles Faust. You can spot them here and here! 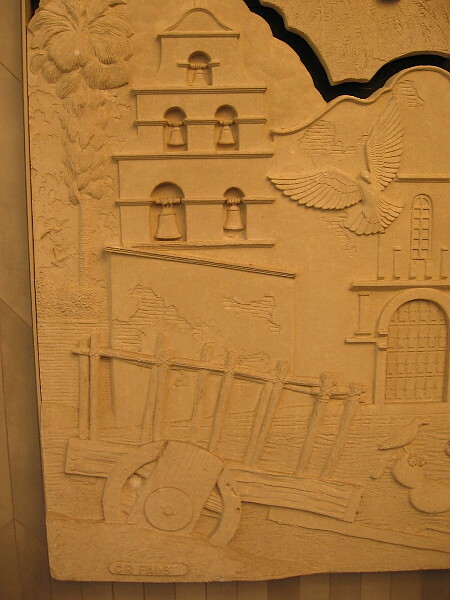 Yesterday morning I spoke to a security guard in the lobby of 5th & Laurel, and he said these two “sand art” panels were moved from a suite in the building where there used to be a bank. I believe they were in Suite 120, once the home of Pacific Premier Bank, and the future home of an upscale Italian restaurant. But I’m not sure about the exact history of these particular panels. If you know anything more about them, please leave a comment! 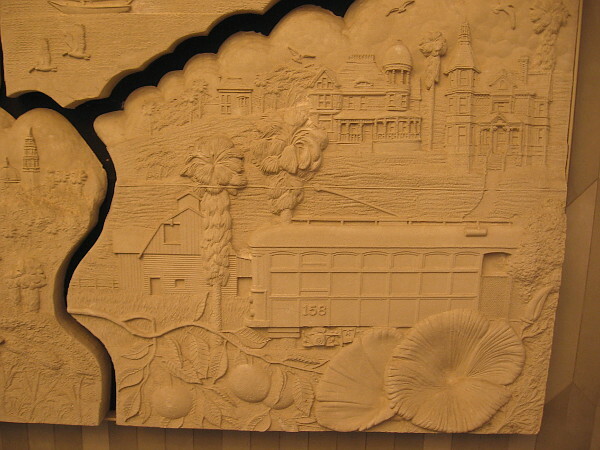 The panel on the left. 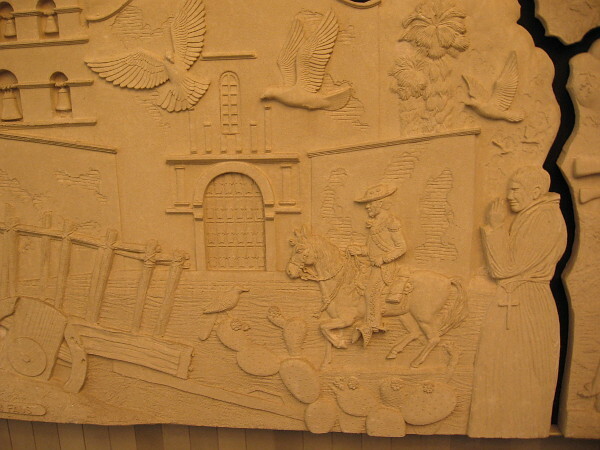 It depicts early San Diego history, including Mission San Diego de Alcalá and the ranchos. A friar outside the Spanish mission. The man on horseback might be a soldier from the old presidio. The bells of Mission San Diego de Alcalá, first Spanish mission in Alta California. Scenes from the Old West in San Diego, including an old wagon and a ride on a bucking horse. 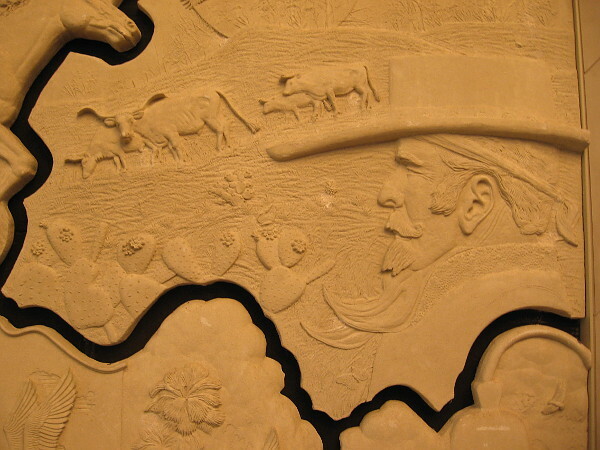 A rancher or vaquero, and a herd of cattle. The panel on the right. 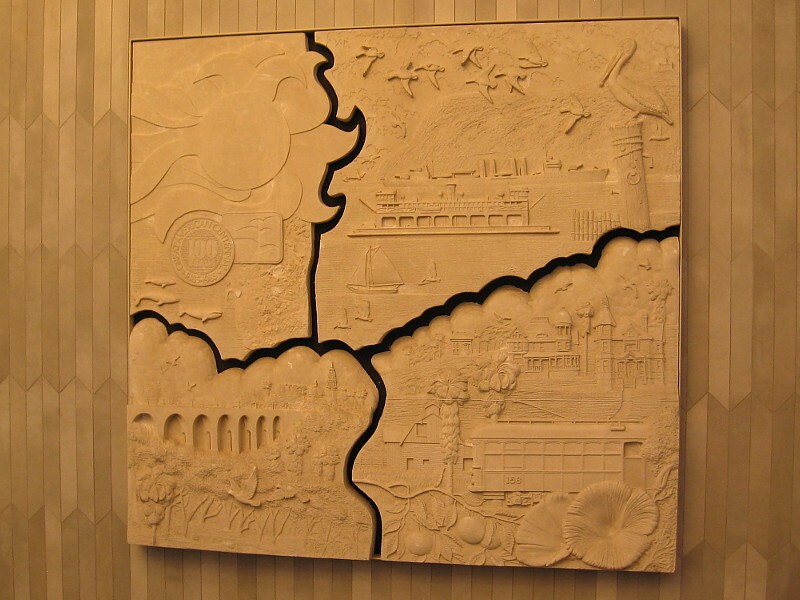 It depicts many later San Diego landmarks. 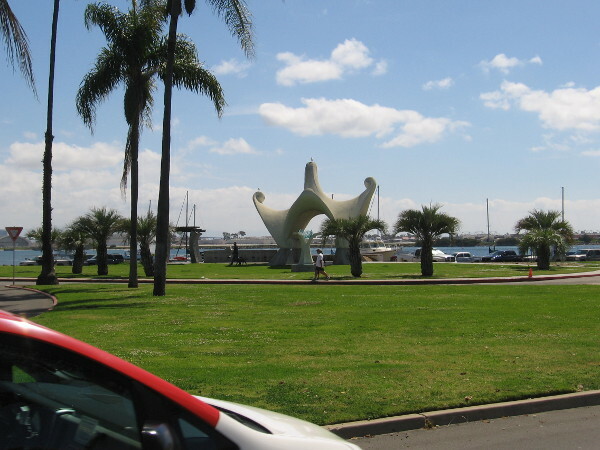 Images include Balboa Park, a streetcar, Coronado ferry, naval ship, farm and Victorian houses. 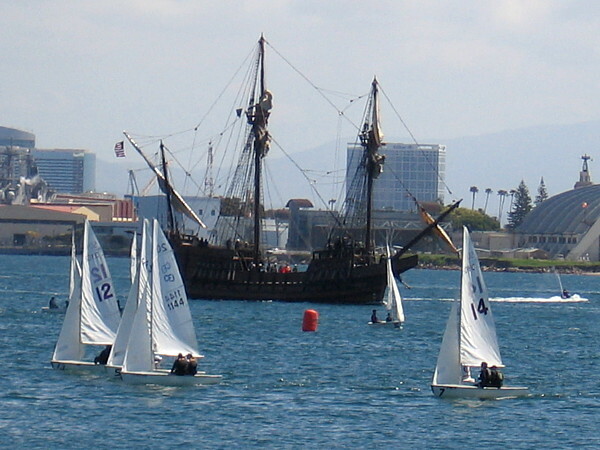 A sailboat and birds share San Diego Bay with a pre-bridge Coronado ferry and an early 20th century Navy warship. In the upper right corner I spy a tiny Old Point Loma Lighthouse! I recognize the Cabrillo Bridge and the California Building and Tower of Balboa Park. I think I recognize the historic Long-Waterman House of Bankers Hill. The house to the right of it might be a south view of the Britt-Scripps House, but it appears a bit different. 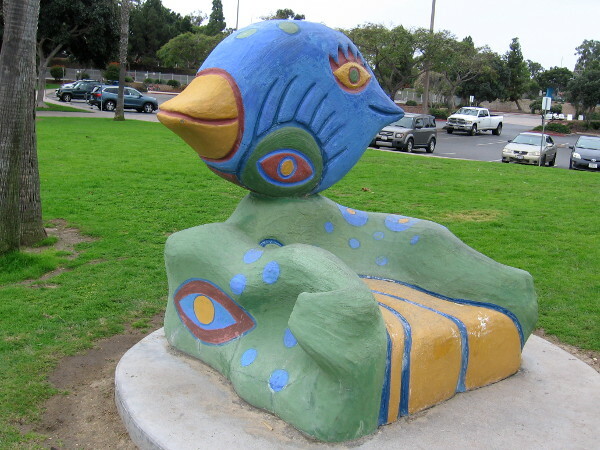 Posted on January 8, 2019 January 8, 2019 Tags architecture, art, artists, bankers hill, beautiful, design, history, landmarks, old west, photo, san diego, san diego zoo, sand sculptures, sculpturesLeave a comment on Sand sculpture murals show San Diego history! 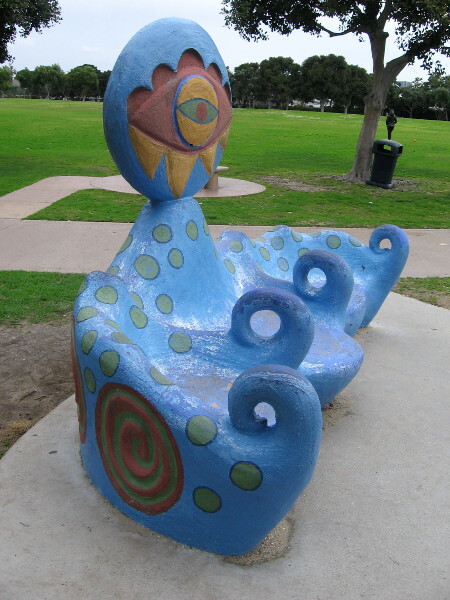 A couple days ago I posted photos of two super fun benches in National City’s Pepper Park. 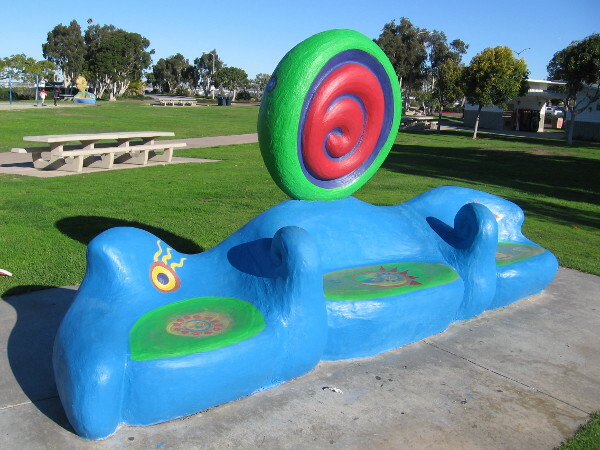 Today, during my walk in Coronado, I visited Tidelands Park in order to photograph two additional benches that were created by the same San Diego artist, Doug Snider. 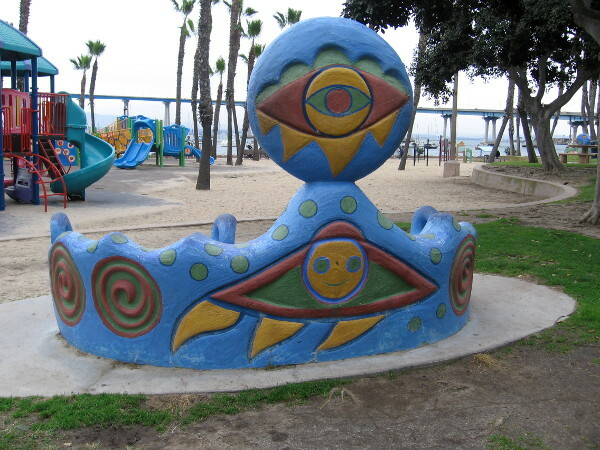 These colorful benches are located at the playground in Coronado Tidelands Park. 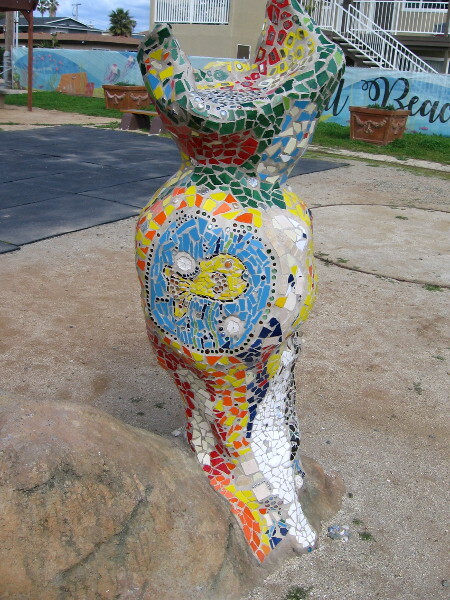 They also debuted in 2006 and are made of painted concrete. Doug Snider is a member of the San Diego Potters’ Guild and operates out of Studio 15 in Balboa Park’s Spanish Village Art Center. 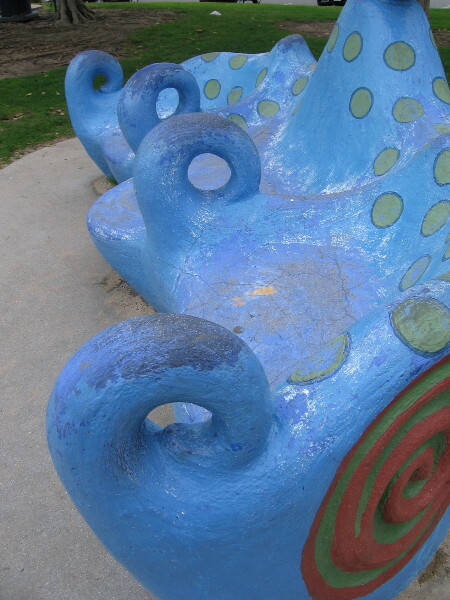 These benches appear to have emerged from a strangely wonderful dream. Wouldn’t you like to sit in one? 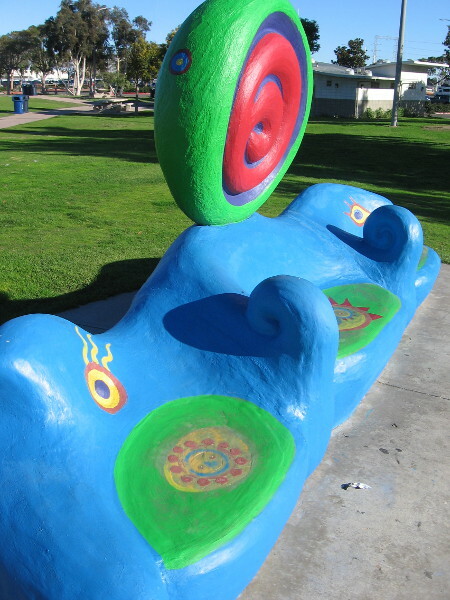 Posted on January 6, 2019 Tags art, color, coronado, crazy, creativity, dreams, fantasy, fun, imagination, kids, parks, photography, public art, sculpturesLeave a comment on Two colorful, fun benches in Tidelands Park! 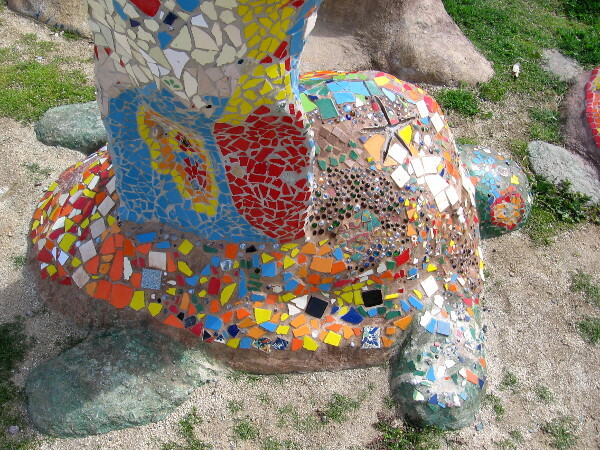 Two colorful, fun benches in Pepper Park! 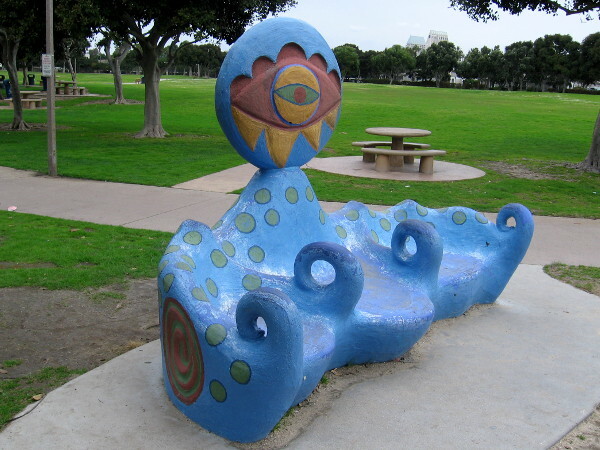 Here are photos of two colorful, super fun benches in National City’s Pepper Park! 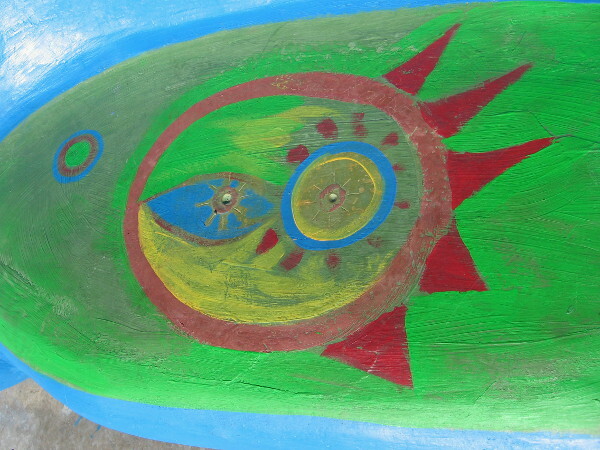 Both painted concrete benches were created in 2006 by Doug Snider, member of the San Diego Potters’ Guild. 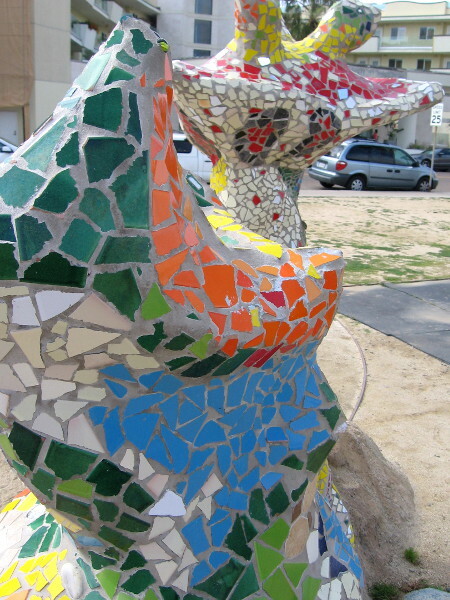 He produces all sorts of amazing art at his Studio 15 in Balboa Park’s Spanish Village Art Center. 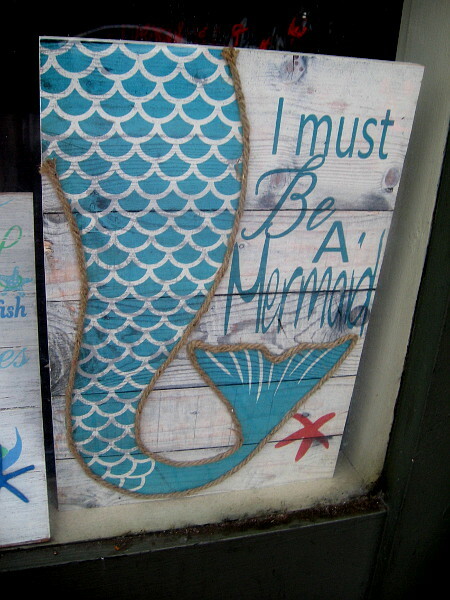 Step into his studio and you’ll feel as if you’ve entered a fantasy world full of whimsy and imagination! I believe Doug has created four of these fantastic benches. 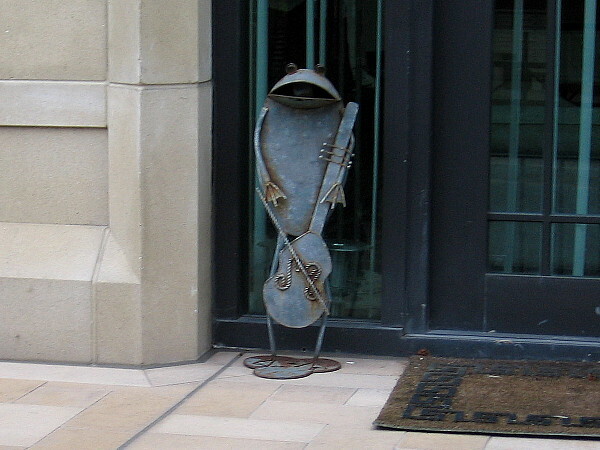 In the past I photographed one of two that are located in Coronado. 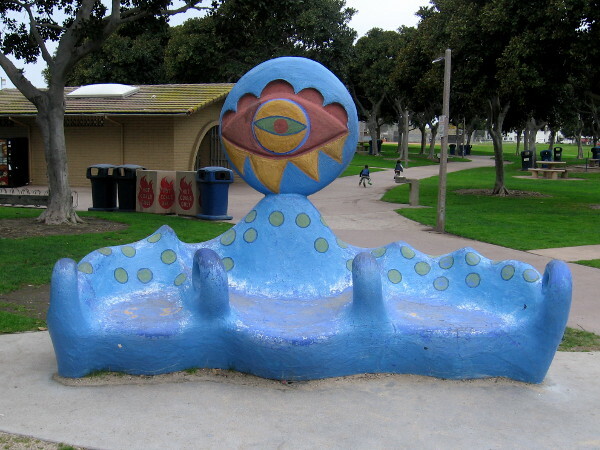 The one I saw is in Tidelands Park, and you can see it here! 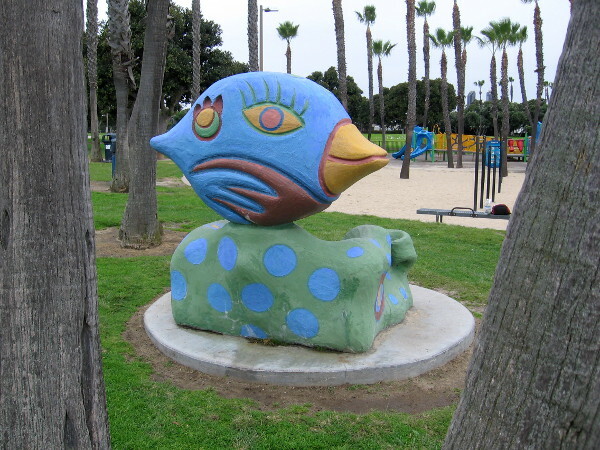 Posted on January 4, 2019 Tags art, artists, color, creativity, fun, imagination, national city, parks, photography, port of san diego, public art, sculptures, south bay, spanish village2 Comments on Two colorful, fun benches in Pepper Park! 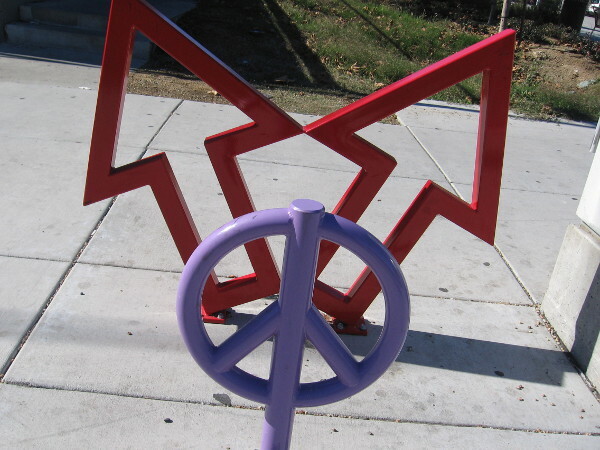 Peace and Arrows public art in National City. 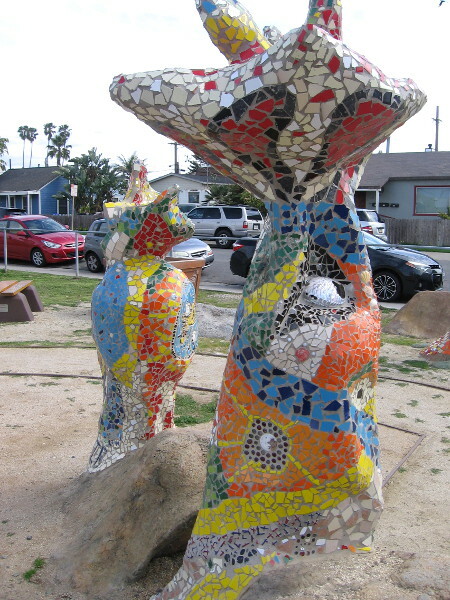 Arrows, by Brenda and Flojo, public art near the 24th Street trolley station in National City. 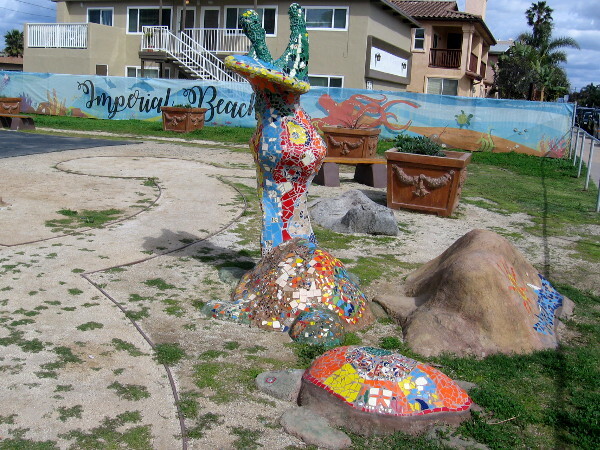 Some very cool public art adds color to a sidewalk near the 24th Street trolley station in National City. 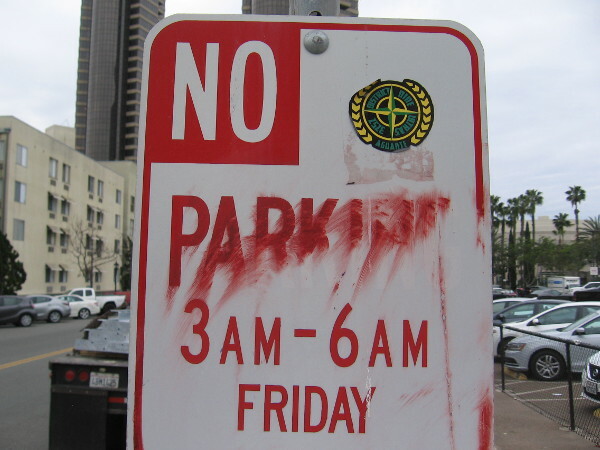 You can find it at the east edge of the trolley station’s parking lot, next to Wilson Avenue. 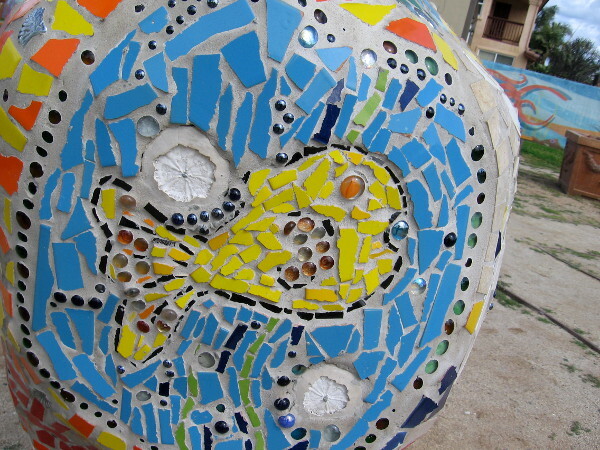 Two small but colorful sculptures have been created by Youth Artists. 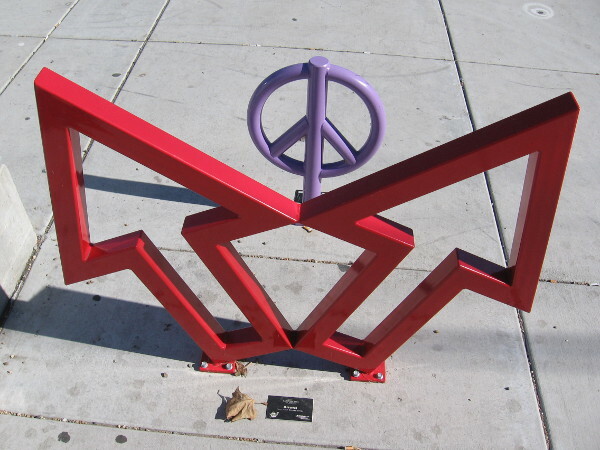 One, titled Peace, is by Michelle. The other, titled Arrows, is by Brenda and Flojo. 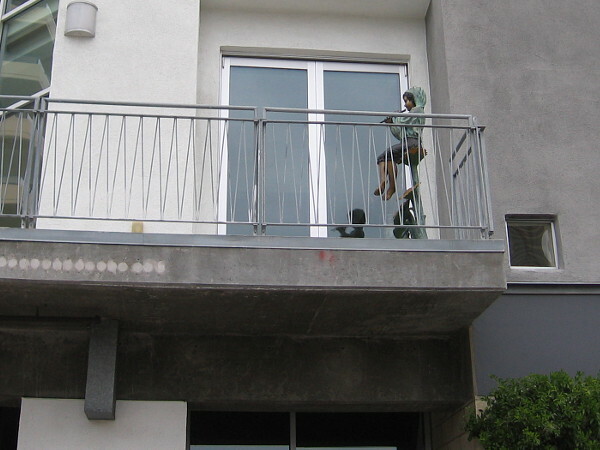 I’ve done some searching on the internet and can find nothing about these public sculptures. I don’t recall seeing them during past visits to the South Bay, so I believe they are relatively new. All I know for certain is that this artwork is really cool! 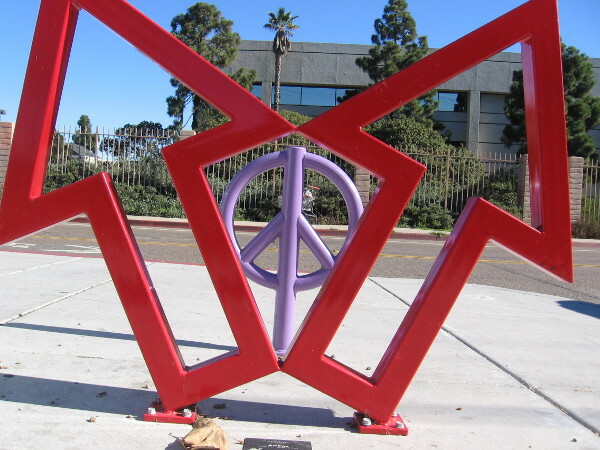 Peace, by Michelle, public art near the 24th Street trolley station in National City. 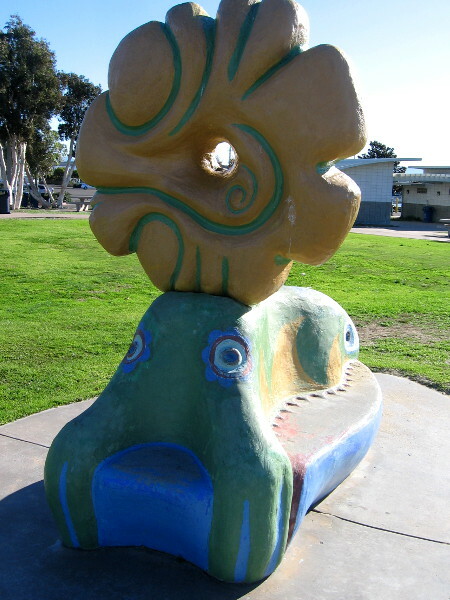 Photo of two cool sculptures in National City. A lavender peace sign is framed by two red arrows! 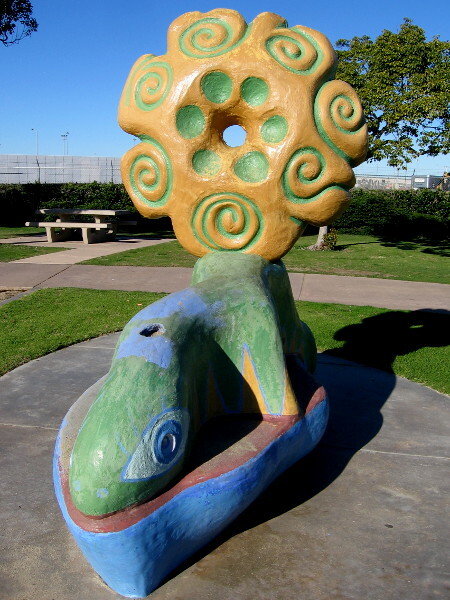 Posted on December 29, 2018 Tags art, artists, artwork, color, cool, kids, national city, peace, photography, public art, sculptures, south bay, streets, trolley stationLeave a comment on Peace and Arrows public art in National City.